With new innovations in Ultrasound, Digital Radiography and MRI portfolio, Samsung Electronics highlights its expansive medical imaging line-up at RSNA 2017. Samsung Electronics, a leader in medical imaging technology, will debut its OmniTom® mobile 16-slice computed tomography (CT) scanner at the Radiological Society of North America (RSNA) 2017 Annual Meeting at McCormick Place in Chicago. 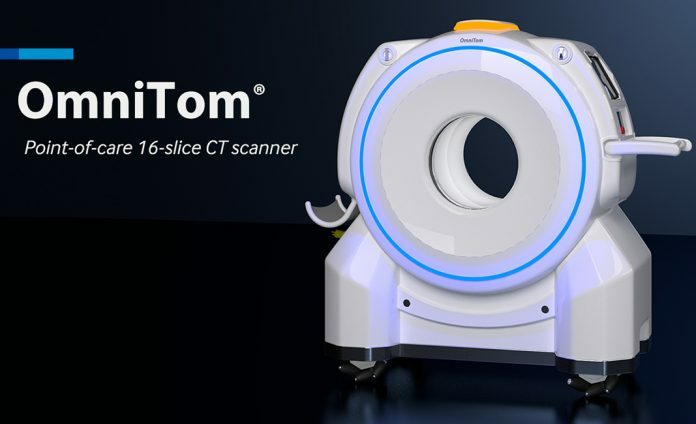 OmniTom received 510(k) FDA clearance for the U.S. market on August 18 of this year, and attendees will get to see it for the first time at RSNA booth #2543 (South Building, Hall A). Improved workflow: OmniTom is the world’s first mobile imaging device with omni-directional wheels, maximizing mobility and allowing easier and quieter movement in small spaces. Superior image quality: 16-slice (0.625 mm per slice) advanced data acquisition system with effective dose optimization. Expanded use: Maintains a small footprint ideal for mobile use while increasing the gantry opening to 40 cm for improved coverage of adult head and neck, and full body pediatric scanning. Enhanced safety system: OmniTom features an internal drive system, making portability less strenuous, while also offering smart-sensing collision avoidance software to maximize control and patient safety. OmniTom is ideal for cranial procedures and is designed to deliver the highest quality non-contrast CT, CT angiography and CT perfusion scans. The combination of its rapid scan time, ultra-small footprint and immediate image viewing makes OmniTom an indispensable tool for collecting real-time data on critically ill patients. The latest product also demonstrates Samsung’s “AccE” (Access, Accuracy and Efficiency) strategy that aims to change the industry by incorporating innovations in physical access to provide care wherever it is needed. It also aims to improve accuracy in diagnosis with advanced algorithms and efficiency with advanced display, UX and information management technology developed by Samsung Electronics. Ultrasound Segment: Samsung will feature their comprehensive general imaging ultrasound portfolio, including the new HS60 and HS40 ultrasound systems which were introduced earlier this year. The RS80A with Prestige, Samsung’s premium general imaging ultrasound system, will be displayed in three daily educational demonstrations featuring live scanning. The RS80A includes innovative technologies for the busy radiology department that help boost clinical confidence. Based on its achievements in ultrasonic diagnosis devices for obstetrics and gynecology, the company is strengthening its premium ultrasonic diagnosis device business for radiology, which has the biggest market potential. Digital Radiography Segment: Samsung will display a wide range of its portfolio including two ceiling-mounted systems, GC85 and GC70, as well as highlight its premium portable GM85 X-ray. The GM85’s enhanced mobility and streamlined workflow will enable users to experience a new level of efficiency along with exceptional image quality. Samsung has also differentiated itself from its competitors by adopting low dose technology for enhanced patient safety. device for arms and/or legs. The prototype is expected to be a game changer in the industry: It is designed to maximize not only cost and space but also patient convenience, as it eliminates the need for the whole body to be in the MRI device. Learn more by visiting Samsung at booth #2543 (South Building, Hall A) at the RSNA 2017 Annual Meeting, as well as following Samsung NeuroLogica on Facebook, Twitter and LinkedIn.